Replacing a worn plasticising screw? Replacing a worn plasticising screw? Shouldn’t you be upgrading for better productivity! December 2, 2015 / Richard Stamps / Comments Off on Replacing a worn plasticising screw? Shouldn’t you be upgrading for better productivity! When you buy a plastic processing machine, the plasticising screw is often supplied with a General Purpose (G.P.) design and nitrided wear resistance. In many cases the OEM won’t have been told you only process particular material grades, and a GP screw provides the biggest processing window across the spectrum of materials. This design however, will always be a compromise…. Both in terms of wear resistance and process capabilities. As an example, if you’re processing a glass filled material, the serviceable life of a nitrided screw will be greatly reduced. 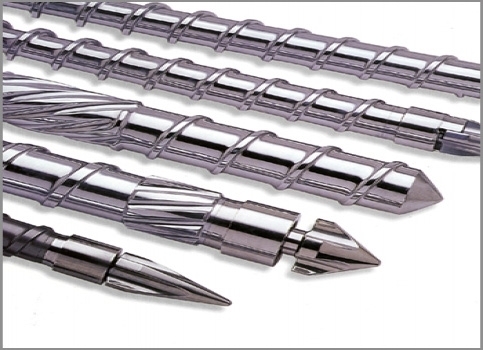 Nitriding produces an extremely hard surface, but only penetrates a few ‘thou’ into the surface of the steel. Once you wear through this layer, the steel below is relatively soft. So when the time comes to replace your original OEM screw, what should you do? Polymer Specific. All quality OEM’s and most independent screw manufacturers will be able to produce a screw with a polymer specific profile. For example, if you are processing nylon, there will be a profile with a less aggressive compression zone, so you are less likely to ‘burn’ your material. Wear Resistance. A variety of hard surfacing materials and surface coatings are available, depending on the type of process and the abrasive and/or corrosive nature of the material. Better Homogeneity. Barrier flights and mixing sections can improve melt consistency and disperse additives (such as colour masterbatch) more evenly. This can often reduce the percentage of masterbatch used. A Better G.P. Screw. A more advanced General Purpose Screw, such as the patented ‘Posi-melt’ solution supplied by Cooper Technology, is an excellent option for Trade Moulders. As for lead times, an OEM is less likely to have a ‘tailored’ design on the shelf, and lead times can be longer than that of a UK based independent specialist. As for cost, you will probably be able to buy a screw with specified profile and/or hard faced flights from a specialist for less than the standard OEM nitrided unit. You can access the UK’s leading independent Screw & Barrel manufacturers using the PlastikCity site. Our manufacturers cover injection moulding and extrusion equipment providing both new and refurbishment units. Plastic vs Metal – is cost the only consideration?